We met once again for our end of the month Sketch&Lunch. This month it was all about regional cuisine. We met in Burwood, and headed straight for some Chinese streetfood. We watched the chef make a flat pancake on the round griddle, drop some eggs on, then chilli paste, a savoury sauce, some crunchy things, and a ham sausage. Fold it up, pop it in a bag, and off we went to sketch! Whilst sketchers sketched, I ate! yum! It was difficult to share this one. Next we headed to the Chinese supermarket. Questions answered, a few specialty items bought, and a wander around Burwood to get our bearings, and see the Chinese community in full swing. We were keen to get to lunch, but so much to do! We decided to sketch the wok shop later, and concentrated on the BBQ shop. Chinese chef would have to be the best all time BBQ masters. Especially when it comes to duck and pork. 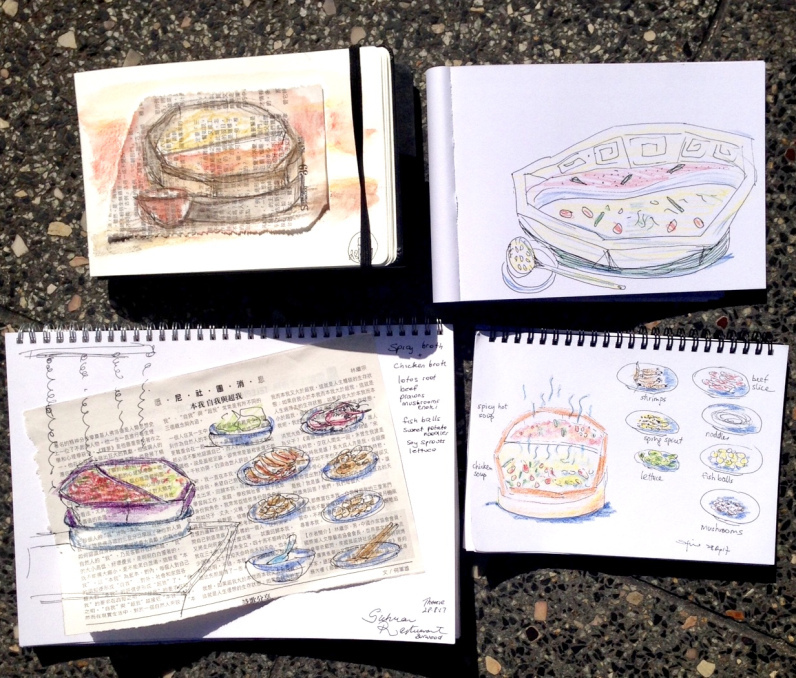 We sketched, we salivated, and we bought a whole bunch of delicious products to take home. Okay, enough looking…time to sit down for some lunch. I was curious to give a Sichuan restaurant that served a steam boat style lunch a try. If for nothing else, the “sketchability” aspect was grand. We ordered by ticking the boxes on the giant list of ingredients. I choose things that I knew look good. Hee hee, always a sketcher. Lotus root, soybean sprouts, whole prawns, enoki mushrooms…. Others ordered food they new was edible! Outrageous (yet wise), so we ended up with a delicious selection of unusual looking ingredients, along with sensible things like beef and noodles. A delicious lunch, and more sketching, and before you knew it, it was time to catch the train home! The next Sketch&Lunch is all about Malaysian food, Monday 25th September. A delicious cuisine that includes delights such as Laksa, Nasi Lemak, Har Mee Prawn Noodle, Hanianese Chicken, and the wok smoke scented Char Kway Teow. Oooooo, gosh, its not hard doing the research for this one at all…..